I never had the opportunity to meet Dr. Grover Krantz, but I had long admired him. He was among the first academics to step up and closely examine the data that supports the existence of the sasquatch. He doggedly pursued evidence until he was no longer able to shortly before his death in 2002. Krantz's footprint cast collection was the largest of his day, and was left to Dr. Jeff Meldrum after Krantz died. Krantz authored a fantastic book on bigfoot evidence, which I consider to be required reading for anyone seriously interested in the subject. When I saw this article, I knew I wanted to share it with you. Being a teacher myself, I admire his passion to continue educating students, even after his death, by donating his body to science. I admire his eccentricity as well. To be rearticulated after his death is an unusual request, and I am thrilled he got his dying wish. And to be rearticulated with his dog! Well... Even better. I had an anthropologist friend who took one of Krantz's osteology classes at Washington State University. She said that he was a weird old guy with a strange sense of humor. I can foresee people saying the same about me after I'm gone. Friends of mine who knew Grover until his death tell me he seemed crotchety on the outside, but was actually a fantastic person. That is, if you could get past the walls he put up to keep the "lunatic fringe" out. Dr. Krantz received a lot of ridicule from his "scientific" peers for his interest in the sasquatch. However, Krantz knew that to write bigfoot off as an impossibility even before examining the evidence is decidedly unscientific. Krantz definitely respected the 'squatch! Diane Horton had last seen her late husband two days after his death in 2002, so when they were reunited at the Smithsonian's Museum of Natural History a few weeks ago she asked for a few private minutes with him. He was standing under spotlights in a huge display case -- all 6 feet 3 inches of him except for a few bones missing here and there. His head was thrown back and his mouth was open, as if in a big laugh, and his arms were around one of his favorite dogs. Here was professor Gordon S. "Grover" Krantz, and all, or almost all, of the phalanges, tarsals, metatarsals and the other 200 or so bones that made up his skeleton. Reassembled with wire, glue and metal. It was an emotional moment, Horton, 66, said. "Wow," she thought. "You had really [an] impossible last wish. And it's been granted." The skeletons of Krantz and his beloved Irish wolfhound, Clyde, make up the striking display that comes at the end of the museum's current forensic anthropology exhibit, "Written in Bone." The two are depicted mimicking an old photograph, with the skeleton of Clyde up on his hind legs and Krantz cradling the dog's forelegs in his arms. They make a startling sight -- cleansed of flesh and fur, revealed down to the bones in the dog's tail and the dental implants in Krantz's mouth. Which is exactly what Krantz wanted. "He looked happy," Horton said. "And Clyde looked happy." 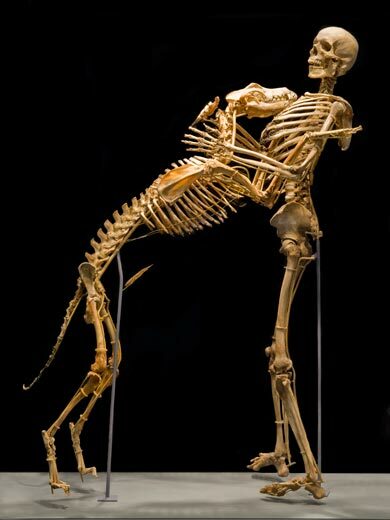 It hadn't been so promising when Krantz announced eight years ago that he wanted to donate his bones to the Smithsonian, with the caveat that he, and maybe the bones of his dogs, be on display. Krantz, who died of cancer at age 70, was an eccentric and revered teacher of osteology -- the study of bones -- at Washington State University. A resident of Port Angeles, Wash., he had long been fascinated with human and animal skeletons, along with the lore of the legendary bigfoot creature, Sasquatch, of the Pacific Northwest. "He was just really curious about how things were put together," said former student John Cardinal, now with the FBI in Washington. After he got sick, and he offered his bones for display, his wife told him he was crazy. "It was an outlandish wish," she said recently. But "he wanted his bones someplace. . . . He thought he would be a good teaching specimen." Krantz was in touch with several universities before the Smithsonian agreed to take the disassembled bones of man and dogs. The museum cautioned Krantz, however, that his "re-articulation," as it is called, and display would be a long shot. "I said that would be a lot of money . . . and we would have to have justification to spend that kind of money," said David R. Hunt, a collections manager in the museum's department of anthropology. Hunt told Krantz that he would remember his wishes if things changed. Krantz's bones first went to the University of Tennessee's "body farm," where scientists study the postmortem breakdown of human remains, and where the scholar's skeleton was cleansed. It came to the Smithsonian in 2003. The bones of Clyde and two more of Krantz's dogs, who died before him, had already arrived at the museum. All went into storage drawers, where it seemed they were likely to stay. Then came the proposal for "Written in Bone," which opened earlier this year. Spurred by the field research of museum forensic anthropologist Doug Owsley, the exhibit was planned as a study of Colonial-era grave sites in the Chesapeake region. Owsley saw an opportunity to include Krantz as a kind of finale that would grab museumgoers just as they were leaving the exhibit. "I just wanted something they might remember," he said. But he faced the cost of reassembling Krantz, a job that would need to be farmed out to an expensive specialist. Owsley wondered, however, if the museum's taxidermist, Paul Rhymer, might be able to tackle the job in-house, and save money. The idea, which originated with Krantz, would be to reassemble him and Clyde together along the lines of the old photograph. Rhymer, 46, who is also a sculptor and usually works on such animals as foxes, monkeys and penguins, agreed to try. He taped up a copy of the photo of Krantz and Clyde, and took the bones, which were in boxes and plastic bags, to his museum workshop. And over several months last fall and winter he brought them to life. He used power tools, hacksaws and a thick book on human anatomy. He got and took lots of advice. He drilled minute holes in the bones, wired ribs together and constructed the delicate, almost invisible, scaffolding on which the skeletons rest. "It was like a jigsaw puzzle," he said. "But it was like putting two together at the same time and having them meet somewhere in the middle." 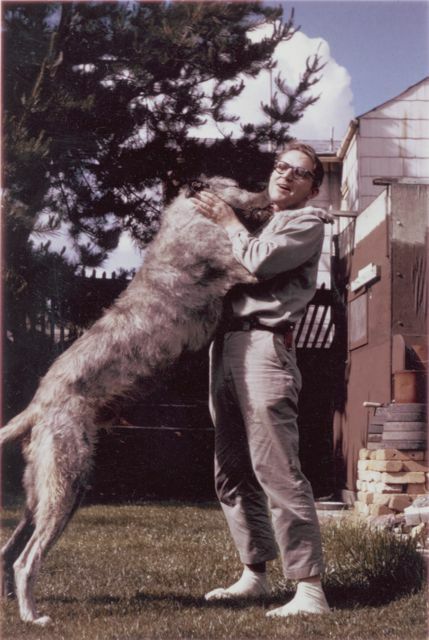 He altered the two poses slightly from the photograph to avoid any impression that Krantz was being attacked by the dog, and to more clearly suggest a "joyful interchange." Clyde, being a familiar "four-footer" to the taxidermist, was easier to assemble. Rhymer started with Krantz. He began with the bones and scaffolding of the spine, and worked his way out. The skull was easy. The ribs wouldn't cooperate. Bones were missing in the hands and feet. Rhymer soon realized that the bones all fit together in a logical way. "It takes a while to figure out, after you've messed with these things, which notches fit in with what notch," he said. "There's no way I could have put the vertebrae in the wrong order. It just wouldn't have fit." "Once I had him from his pelvis, and I had his head on, and I had him at what I thought was going to be the right height, I thought, 'Okay, this is going to work,' " Rhymer said. Earlier this month, with the museum thronged with spring tourists, there was an array of reactions to Krantz and Clyde. "Freaky!" said one young visitor. "Amazing," said a fifth-grade teacher. "That is a big dog," said a woman. "That is a big person," said a little girl. "Looks like he's smiling. Creepy and Sweet at the same time. That is a BIG dog. I was a student of Dr. Krantz back in the mid 90's. His class was one that I remember most! He waited till the last two weeks of the semester to discuss his thoughts about Bigfoot and well worth the wait.